D. Miyazaki, M. Furuta, and S. Kawahito, "A 16mW 30Msample/s 10b Pipelined A/D Converter Using Pseudo Differential Architecture", Dig. of Tech. Papers, IEEE Int. Solid-State Circuits Conf., no.10.5, pp.174-175,Feb. 2002. D. Miyazaki, S. Kawahito, and M. Furuta, "A 10-b 30-MS/s Low-Power Pipelined CMOS A/D Converter Using a Pseudodifferential Architecture", IEEE Journal of Solid-State Circuits, Vol.38, No.2, pp.369-373, 2003. 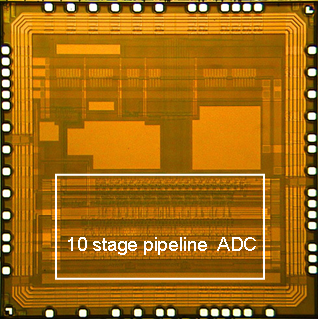 K. Honda, F. Masanori, and S. Kawahito, "A 1V 30mW 10b 100MSample/s Pipeline A/D Converter Using Capacitance Coupling Techniques", Proc. 2006 Symp. on VLSI Circuits, 25.4, Pp.276-277, Jun.2006. K. Honda, M. Furuta, and S. Kawahito, "A Low-Power Low-Voltage 10-bit 100-MSample/s Pipeline A/D Converter Using Capacitance Coupling Techniques", IEEE Journal of Solid-State Circuits, Vol.42, No.4, pp.-, 2007.